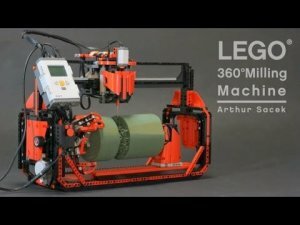 You can spend tens of thousands of dollars and purchase a 3D milling machine, or you can do like one guy did and simply make one of Lego parts—though it probably wasn't at all simple to make. They both kind of do the same thing. The builder, Arthur Sacek, built this particular Lego 3D milling machine to compete in the 2011 World Robot Olympiad, but he has actually built a few different Lego machines that can do a number of tasks. As seen in the video, the 3d miller does a really good job at shaping foam into little green statues. From what I understand, the entire machine is built out of Legos and the Lego Mindstorm system, with the exception of the milling bit and the computer running everything. I guess you can pretty much do anything with the right know-how and some basic building blocks. Check out some of his other creations below.